↑ अ आ Savory, R. M., संपा॰ (1976). Introduction to Islamic Civilisation. Cambridge University Press. पृ॰ 82. आई॰ऍस॰बी॰ऍन॰ 0-521-20777-0. ↑ Black, Edwin (2004). Banking on Baghdad: Inside Iraq's 7,000-year History of War, Profit and Conflict. John Wiley and Sons. पृ॰ 38. आई॰ऍस॰बी॰ऍन॰ 0-471-67186-X. ↑ अ आ इ C.E. Bosworth, "Turkish Expansion towards the west" in UNESCO History of Humanity, Volume IV, titled "From the Seventh to the Sixteenth Century", UNESCO Publishing / Routledge, p. 391: "While the Arabic language retained its primacy in such spheres as law, theology and science, the culture of the Seljuk court and secular literature within the sultanate became largely Persianized; this is seen in the early adoption of Persian epic names by the Seljuk rulers (Qubād, Kay Khusraw and so on) and in the use of Persian as a literary language (Turkish must have been essentially a vehicle for everyday speech at this time)." ↑ Stokes 2008, पृ॰ 615. ↑ Grousset, Rene (1988). 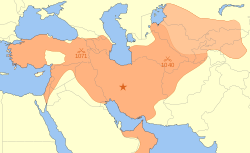 The Empire of the Steppes. New Brunswick: Rutgers University Press. पपृ॰ 159, 161. आई॰ऍस॰बी॰ऍन॰ 0-8135-0627-1. In 1194, Togrul III would succumb to the onslaught of the Khwarizmian Turks, who were destined at last to succeed the Seljuks to the empire of the Middle East. ↑ Turchin, Peter; Adams, Jonathan M.; Hall, Thomas D (December 2006). "East-West Orientation of Historical Empires". Journal of world-systems research. 12 (2): 223. आइ॰एस॰एस॰एन॰ 1076-156X. अभिगमन तिथि 13 September 2016. ↑ Rein Taagepera (September 1997). "Expansion and Contraction Patterns of Large Polities: Context for Russia". International Studies Quarterly. 41 (3): 496. डीओआइ:10.1111/0020-8833.00053. अभिगमन तिथि 13 September 2016.